Ben Roethlisberger, nicknamed Big Ben, plays quarterback for the Pittsburgh Steelers. He was drafted by the Steelers in the 2004 NFL Draft. Roethlisberger earned the AP NFL Offensive Rookie of the Year in 2005. He became the youngest Super Bowl-winning quarterback in NFL history, helping to lead the Steelers to a 21-10 victory over the Seattle Seahawks in Super Bowl XL at the age of 23. He was named to his first Pro Bowl in 2007. He currently ranks 4th all-time in NFL passer rating with a 93.0, and 5th all-time in Yards Per Attempt with a 8.08 average (min. 1500 attempts). Playing Field Promotions is a booking agent for motivational sports speakers and celebrities. 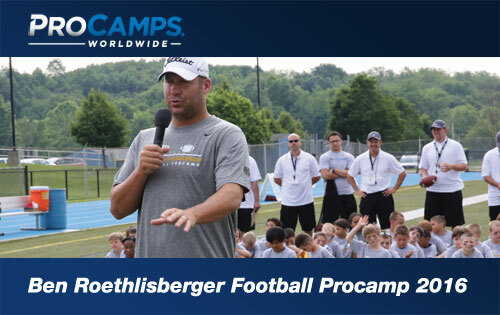 If you would like to book Ben Roethlisberger for a speaking engagement or appearance, contact a Ben Roethlisberger booking agent for appearance & speaker fees at 1.800.966.1380.